Hosting can be complicated. Lot’s of choices and things you just don’t understand. We simplify this for you by managing your website hosting on some of Australia’s fastest and reliable servers. We offer both Budget and Premium hosting options to suit everyone. You’ll also be pleasantly surprised to find that our Premium prices aren’t premium at all. Read on. Get full money back on your hosting within 90 days if you are not satisfied for any reason. No questions asked. There is a reason why we use Vultr servers, that’s because they are 4x faster than the competition. Read more about this on their website. Our servers are located in Australia. That means your website loads super fast, every time. But it doesn’t just stop there. We can host in multiple locations, depending on where your main market stream is coming from. We can set automated hourly to weekly backups of your website to an offsite location and restore latest backups with 1-click at the console. Something went wrong? We can reload from an older copy. Expecting increased traffic on your website? About to run a big promotion? We can scale your servers with 1-Click Scaling that scales both the RAM and storage. All servers on the Cloudways Platform are protected by highly sophisticated firewalls. Need extra security? Ask us about our about advanced security measures. Just added a shop or would like to boost your Google credibility? One-click Free SSL for your website to get the HTTPS status. What happens when my website goes down? In the rare chance that your website is not loading, here are some suggestions. The quickest way is to see if the server is up and running. If your business is based in Australia — see Sydney. https://vultr.com/status. Sydney server down? Don’t worry, this happens extremely rarely and get fixed fast. Contact Vultr directly or follow their status updates. 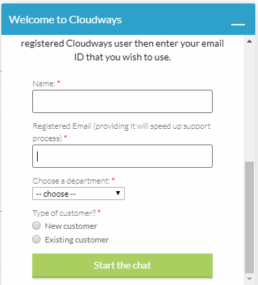 If the server is running on Vultr, the issue may be with Cloudways. With 24-hour online chat support, you can run any questions past them. They will be able to either fix it or point you in the right direction.